A SWOT Analysis may have a simple presentation, but the analysis is the hard part. My clients have really appreciated this 1-page SWOT (Strengths, Weaknesses, Opportunities and Threats) Analysis with Action items. One CEO included it in her presentation to investors because it very clearly and transparently showed the company’s situation and what we planned to do to grow the business. So what about the hard part – the analysis? I recommend getting stakeholders in your business involved beyond your management team and certainly beyond the founders of the business, who may have too much of an emotional (and financial) tie to the company to face the truth. Include trusted vendors, top distributors and sales people (if you can successfully sell a product or service, you quickly learn the business strengths, weaknesses, opportunities and threats), board members, consultants and employees at all levels. You can do a SWOT analysis in a face-to-face meeting, but your meeting format and company culture must allow open sharing of both positive and negative aspects of the business. Not all employees at many companies are comfortable telling “the boss” what’s wrong with the business. You can also start with a simple online or offline survey to get feedback – some feel that their feedback via a survey is more anonymous than in person. Then get the people in the room face-to-face to discuss the feedback. Once you have your information, get the right people in the room to discuss what to do about it. How can you maximize strengths and opportunities? How can you minimize your weaknesses and threats? Then, put the information on one page and use it when you develop your strategy and business and marketing plans. At regular intervals, survey (either formally or informally) your SWOT Analysis participants to see if you’ve made progress with your planned actions. 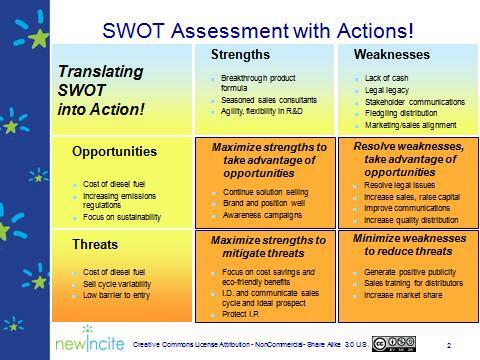 Do you use a SWOT analysis for your business or for your clients? What do you think of them as an assessment tool? Please comment below. Previous post: What to Do When the Social Media Horse Has Already Left The Barn?